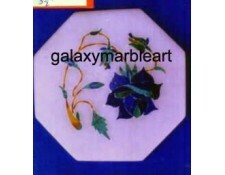 marble inlay tiles octagonal tiles 3.5"
AGRA MARBLE INLAY TILES OCTAGONAL-3.5",4",5"
These tiles comes in various designs. Tiles are made by using different stones like Lapis lazuli, Malachite, Tiger eye, Mother of Pearl, Jasper and various other stones. We also make designs according to the orders.